Weight loss has never been this easy and delicious. Our medical weight loss programs provides you with great tasting recipes to make your weight loss fun and easy. Heat 1 TBS broth in a stainless steel wok or 12 inch skillet. Healthy Stir Fry onion in broth over medium high heat for 2 minutes, stirring constantly. Add ginger, garlic, mushrooms and asparagus. Continue to stir fry for another 3 minutes, stirring constantly. Add lemon juice, soy sauce, mirin, red pepper flakes, snapper, scallops, shrimp and stir to mix well. Cover and simmer for just about 5 minutes stirring occasionally on medium heat. Toss in tomatoes, cilantro, salt and pepper. Serve. Heat 1 TBS broth in a 10-12 inch stainless steel skillet. Healthy Sauté scallion, garlic, ginger and mushrooms in broth for about 2 minutes, stirring constantly over medium heat. Add orange juice and cook for another 2 minutes, and add rest of ingredients. While sauce is simmering, preheat another non-stick skillet big enough to hold tuna over medium high heat for 3-4 minutes and place tuna in it. Cook for about 11⁄2 -2 minutes and turn. Cook for another 1.1⁄2 -2 minutes. This is our (Stovetop Searing) cooking method. Place on plates and pour mushroom sauce over each steak. Or you can lay a bed of mushroom sauce on each plate and place tuna on top. time. Toss romaine with desired amount of dressing and walnuts if using them. There will be dressing left over. It saves very well in your refrigerator for 2 weeks. Combine first seven ingredients and shape into 12meatballs. Brown in oil in skillet, remove excess fat. Combine tomato sauce, brown sugar, vinegar and seasoned salt. Pour over meatballs. Simmer over low heat 10-15 minutes, turning frequently until meatballs are well glazed. Serve over rice or noodles. Rinse and dry salad greens. This is done best in a salad spinner. Divide between 4 plates and top with rest of ingredients. Whisk together vinegar, oil, salt and pepper and drizzle on top of salad. Bring lightly salted water to a boil in a steamer.Rinse greens well, fold leaves in half and pull or cut out stem. Discard stems. Chop leaf and steamfor about 7 minutes. Add mushrooms, onion and steam for another 5 minutes. Mix together lemon juice, ginger, garlic, soy sauce, olive oil, salt, and pepper in a small bowl. When greens are almost done poach eggs until desired doneness. This will take about 5 minutes, or just until the white is set and the yolk has filmed over. Press greens with the back of a spoon slightly to remove excess water. Remove vegetables from steamer and toss with dressing. Remove eggs from water with a slotted spoon and place on plate of tossed greens. Prepare vegetables by chopping them and having them ready. Pureé tofu with egg whites, Italian seasoning and turmeric in blender. In 10 inch stainless steel pan, Healthy Sauté onion, garlic, zucchini, bell pepper, kale, and tomato for about 1 minute over medium low heat, stirring often. Add broth and red wine vinegar. Pour tofu mixture over vegetables, cover and cook over low heat until mixture is completely firm and cooked, about 12 minutes. Top with chopped parsley. 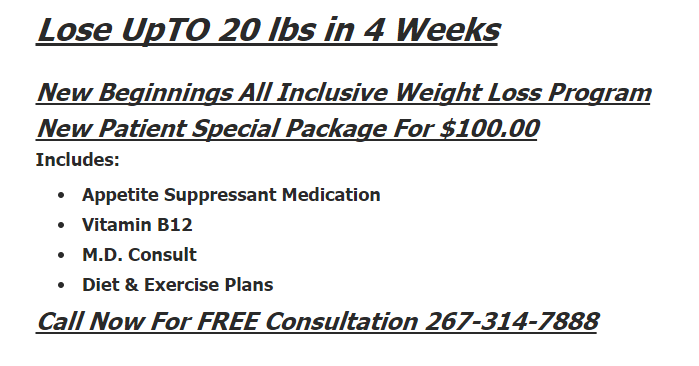 Call 267-314-7888 for a weight loss consultation.